Jasprit Bumrah said India were "a little surprised" with Virat Kohli's contentious dismissal on day three but is confident they can chase down any target to beat Australia at Perth Stadium. Kohli made an imperious 25th Test century on Sunday but was clearly disgruntled when he was given out for 123 after edging Pat Cummins to Peter Handscomb in the slips. Third umpire Nigel Llong did not see enough evidence to overturn Kumar Dharmasena's decision, but the tourists were not convinced the ball had carried to Handscomb. "We were a little surprised by the on-field call, but now that it's been done, it's been done, so we will move forward with the game." said India paceman Bumrah. Nathan Lyon took 5-67 as India collapsed from 223-4 to 283 all out to give Australia a first-innings lead of 43 runs. 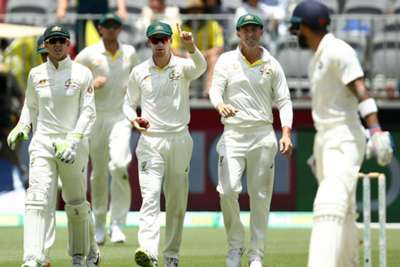 India hit back with the ball to give themselves hope, reducing Tim Paine's side to 132-4 with doubts over whether Aaron Finch will be able to bat on day four after retiring hurt on 25 with a finger injury. Bumrah, who deserved more than the one wicket he claimed, believes the top-ranked side have every chance of taking a 2-0 lead. "Tomorrow the first session will be very important, we want to take early wickets and reduce the total as much as possible." he said. "In my eyes I feel our team is capable of chasing any total but we will try to minimise as much as possible."